Jane Onyanga-Omara, “Al-Qaeda second-in-command killed in U.S. airstrike,” USA Today, June 17, 2015, http://www.usatoday.com/story/news/world/2015/06/16/al-qaeda-says-leader-killed/28796037/. From 2006 until he began to lead AQAP, Raymi directed the movement of al-Qaeda fighters and played a key role in the group’s seizure of territory in Yemen’s southern provinces.Gregory D. Johnsen, “A Profile of AQAP’s Upper Echelon,” Combatting Terrorism Center, July 24, 2012, https://www.ctc.usma.edu/posts/a-profile-of-aqaps-upper-echelon. Raymi, who was trained by al-Qaeda in Afghanistan in the 1990s,Thomas Joscelyn, “Fifteen years after the 9/11 attacks, al Qaeda fights on,” Long War Journal, September 11, 2016, http://www.longwarjournal.org/archives/2016/09/fifteen-years-after-the-911-attacks-al-qaeda-fights-on.php. was imprisoned in 2005 in Sanaa, Yemen, for connections to terror activity.Gregory D. Johnsen, “Tracking Yemen’s 23 Escaped Jihadi Operatives- Part 2,” Jamestown Foundation, October 24, 2007, http://www.jamestown.org/single/?no_cache=1&tx_ttnews%5Bswords%5D=8fd5893941d69d0be3f378576261ae3e&tx_ttnews%5Bany_of_the_words%5D=Yemen&tx_ttnews%5Bpointer%5D=3&tx_ttnews%5Btt_news%5D=4466&tx_ttnews%5BbackPid%5D=7&cHash=dc7a3e8ab7#.VQhxnY7F-Qw. In February 2006, he escaped from prison alongside 22 other prisoners, including Wuhayshi, who was then a high-ranking member of al-Qaeda in Yemen—AQAP’s precursor.“Designations of AQAP Leaders Qasim al-Rimi and Nayif al-Qahtani,” U.S. Department of State, May 11, 2010, http://www.state.gov/j/ct/rls/other/des/143206.htm. Following his escape, Raymi helped Wuhayshi to rebuild al-Qaeda in Yemen’s fractured network, and the pair oversaw the merging of the Yemeni and Saudi al-Qaeda branches to form AQAP in 2009.Gregory D. Johnsen, “A Profile of AQAP’s Upper Echelon,” Combatting Terrorism Center, July 24, 2012, https://www.ctc.usma.edu/posts/a-profile-of-aqaps-upper-echelon. 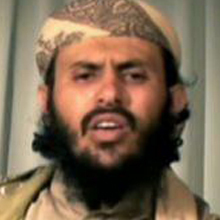 Raymi played a large role in “reviving the regional node of al-Qaeda” and “recruiting the current generation of militants making up the Yemen-based AQAP,” according to the U.S. Department of State.“Designations of AQAP Leaders Qasim al-Rimi and Nayif al-Qahtani,” U.S. Department of State, May 11, 2010, http://www.state.gov/j/ct/rls/other/des/143206.htm. Before officially taking over as AQAP’s emir, Raymi served as the group’s Military Commander and successfully captured territory throughout Yemen’s southwestern regions.Gregory D. Johnsen, “A Profile of AQAP’s Upper Echelon,” Combating Terrorism Center,” July 24, 2012, https://www.ctc.usma.edu/posts/a-profile-of-aqaps-upper-echelon. Raymi has been erroneously reported killed numerous times—including by a U.S. airstrike in June 2010.Gregory D. Johnsen, “A Profile of AQAP’s Upper Echelon,” Combating Terrorism Center,” July 24, 2012, https://www.ctc.usma.edu/posts/a-profile-of-aqaps-upper-echelon. Following Raymi’s June 2015 preferment to head of AQAP, the leader reaffirmed his loyalty to al-Qaeda emir Ayman al-Zawahiri in a July 2015 online video. “I pledge allegiance to you [Zawahiri]…and to wage jihad in the cause of Allah the Almighty,” Raymi professed.Thomas Joscelyn, “New AQAP Leader renews allegiance to the ‘beloved father,’ Ayman al Zawahiri,” Long War Journal, July 9, 2015, http://www.longwarjournal.org/archives/2016/09/fifteen-years-after-the-911-attacks-al-qaeda-fights-on.php. He said the pledge was on behalf of all of AQAP, and promised the fight against the United States would continue.Thomas Joscelyn, “New AQAP Leader renews allegiance to the ‘beloved father,’ Ayman al Zawahiri,” Long War Journal, July 9, 2015, http://www.longwarjournal.org/archives/2016/09/fifteen-years-after-the-911-attacks-al-qaeda-fights-on.php. “Executive Order 13224,” U.S. Department of the Treasury, accessed March 17, 2015, http://www.treasury.gov/resource-center/sanctions/Programs/Documents/terror.pdf. On the same day, the U.N. Security Council added Raymi to its ISIL (Da’esh) and Al-Qaida Sanctions List.“ISIL (Da'esh) and Al-Qaida Sanctions List,” United Nations Security Council, accessed November 8, 2018, https://www.un.org/sc/suborg/en/sanctions/1267/aq_sanctions_list. In an October 30, 2018, al-Qaeda video message, the group reveals that Qasim al-Raymi is ill.“New video message from al-Qā’idah in the Arabian Peninsula: ‘Demolishing of the Espionage: Part One ‘Industry of the Espionage'’’,” Jihadology, October 30, 2018, (min. 11), https://jihadology.net/2018/10/30/new-video-message-from-al-qaidah-in-the-arabian-peninsula-demolishing-of-the-espionage-part-one-industry-of-the-espionage/; “Al-Qaeda in Yemen casually reveals its leader is unwell in new video,” BBC Monitoring, October 31, 2018, https://monitoring.bbc.co.uk. Thomas Joscelyn, Twitter post, November 9, 2018, 8:19 AM, https://twitter.com/thomasjoscelyn/status/1060929918266208264; Mina al-Lami, Twitter post, October 31, 2018, 8:35 AM, https://twitter.com/Minalami/status/1057657231943131136. Qasim Mohamed Mahdi al-Rimi“COMMISSION IMPLEMENTING REGULATION (EU) 2016/1063,” EUR-Lex, accessed November 8, 2018, https://eur-lex.europa.eu/legal-content/EN/TXT/?uri=celex:32016R1063. Qasim Al-Rimi“COMMISSION IMPLEMENTING REGULATION (EU) 2016/1063,” EUR-Lex, accessed November 8, 2018, https://eur-lex.europa.eu/legal-content/EN/TXT/?uri=celex:32016R1063. Qassim al-Raymi“COMMISSION IMPLEMENTING REGULATION (EU) 2016/1063,” EUR-Lex, accessed November 8, 2018, https://eur-lex.europa.eu/legal-content/EN/TXT/?uri=celex:32016R1063. Qasim al-Rami“COMMISSION IMPLEMENTING REGULATION (EU) 2016/1063,” EUR-Lex, accessed November 8, 2018, https://eur-lex.europa.eu/legal-content/EN/TXT/?uri=celex:32016R1063. Qassim al-Raimi“Information that brings to justice Qasim al-Rimi,” U.S. Department of State, accessed November 9, 2018, https://rewardsforjustice.net/english/qasim_al_rimi.html. Qassem al-Remi“Information that brings to justice Qasim al-Rimi,” U.S. Department of State, accessed November 9, 2018, https://rewardsforjustice.net/english/qasim_al_rimi.html. Qasim Mohammed Mahdi Al Remi“COMMISSION IMPLEMENTING REGULATION (EU) 2016/1063,” EUR-Lex, accessed November 8, 2018, https://eur-lex.europa.eu/legal-content/EN/TXT/?uri=celex:32016R1063. Qassim Mohammad Mahdi Al Rimi“COMMISSION IMPLEMENTING REGULATION (EU) 2016/1063,” EUR-Lex, accessed November 8, 2018, https://eur-lex.europa.eu/legal-content/EN/TXT/?uri=celex:32016R1063. Qasim Yahya Mahdi ‘Abd al-Rimi“COMMISSION IMPLEMENTING REGULATION (EU) 2016/1063,” EUR-Lex, accessed November 8, 2018, https://eur-lex.europa.eu/legal-content/EN/TXT/?uri=celex:32016R1063. Qasim Yahya Mahdi al-RaymiGregory D. Johnsen, “Tracking Yemen’s 23 Escaped Jihadi Operatives- Part 2,” Jamestown Foundation, October 24, 2007, http://www.jamestown.org/single/?no_cache=1&tx_ttnews%5Btt_news%5D=4466#.VWzOdM9VhBd. Abu Hurayrah al-Sana’ai“COMMISSION IMPLEMENTING REGULATION (EU) 2016/1063,” EUR-Lex, accessed November 8, 2018, https://eur-lex.europa.eu/legal-content/EN/TXT/?uri=celex:32016R1063. Abu Hurayrah Al-San’ai“Information that brings to justice Qasim al-Rimi,” U.S. Department of State, accessed November 9, 2018, https://rewardsforjustice.net/english/qasim_al_rimi.html. Abu Hurayrah“COMMISSION IMPLEMENTING REGULATION (EU) 2016/1063,” EUR-Lex, accessed November 8, 2018, https://eur-lex.europa.eu/legal-content/EN/TXT/?uri=celex:32016R1063. Doctor Hurayrah“The Guantanamo Docket: Ali Yahya Mahdi al Raimi,” New York Times, accessed November 9, 2018, https://www.nytimes.com/interactive/projects/guantanamo/detainees/167-ali-yahya-mahdi-al-raimi. Abu Harayrah“Information that brings to justice Qasim al-Rimi,” U.S. Department of State, accessed November 9, 2018, https://rewardsforjustice.net/english/qasim_al_rimi.html. Abu Hajer“The Guantanamo Docket: Ali Yahya Mahdi al Raimi,” New York Times, accessed November 9, 2018, https://www.nytimes.com/interactive/projects/guantanamo/detainees/167-ali-yahya-mahdi-al-raimi. Abu ‘Ammar“COMMISSION IMPLEMENTING REGULATION (EU) 2016/1063,” EUR-Lex, accessed November 8, 2018, https://eur-lex.europa.eu/legal-content/EN/TXT/?uri=celex:32016R1063. Sheikh KasimThomas Joscelyn, “AQAP claims Saudi spy network targeted its leaders,” Long War Journal, September 4, 2018, https://www.longwarjournal.org/archives/2018/09/aqap-claims-saudi-spy-network-targeted-its-leaders.php. The U.S. designated Qasim al-Rimi a Specially Designated Global Terrorist under Executive Order 13224 on May 11, 2010.“Designations of AQAP Leaders Qasim al-Rimi and Nayif al-Qahtani,” U.S. Department of State, May 11, 2010, http://www.state.gov/j/ct/rls/other/des/143206.htm; “Executive Order 13224,” U.S. Department of the Treasury, accessed March 17, 2015, http://www.treasury.gov/resource-center/sanctions/Programs/Documents/terror.pdf. The U.S. Department of State Rewards for Justice Program is offering up to a $10 million reward for information that brings Qasim al-Rimi to justice.“Information that brings to justice Qasim al-Rimi,” U.S. Department of State, accessed March 17, 2015, http://www.rewardsforjustice.net/english/qasim_al_rimi.html. The United Kingdom listed Qasim Mohamed Mahdi al-Rimi as an Asset Freeze Target on May 26, 2010.“CONSOLIDATED LIST OF FINANCIAL SANCTIONS TARGETS IN THE UK,” GOV.UK, last modified October 19, 2018, http://hmt-sanctions.s3.amazonaws.com/sanctionsconlist.htm. The United Nations Security Council added Qasim Mohamed Mahdi al-Rimi to its ISIL (Da'esh) and Al-Qaida Sanctions List on May 11, 2010.“ISIL (Da'esh) and Al-Qaida Sanctions List,” United Nations Security Council, accessed November 8, 2018, https://www.un.org/sc/suborg/en/sanctions/1267/aq_sanctions_list. The European Union listed Qasim Mohamed Mahdi al-Rimi as a “natural person” associated with the ISIL (Da'esh) and Al-Qaida organisations on May 11, 2010.“COMMISSION IMPLEMENTING REGULATION (EU) 2016/1063,” EUR-Lex, accessed November 8, 2018, https://eur-lex.europa.eu/legal-content/EN/TXT/?uri=celex:32016R1063. Saudi Arabian security officials added Qasim al-Rimi to a list of 85 suspected militants wanted around the world on February 3, 2009.“Kingdom unveils list of 85 wanted militants abroad,” Arab News, February 3, 2009, http://www.webcitation.org/query?url=http%3A%2F%2Fwww.arabnews.com%2F%3Fpage%3D1%26section%3D0%26article%3D118850%26d%3D3%26m%3D2%26y%3D2009&date=2009-09-10. Qasim al-Raymi is a U.S.-designated terrorist and the emir (leader) of al-Qaeda in the Arabian Peninsula, (AQAP). Addressing lone jihadists in Western countries: “We don’t view you as an individual – even though it is referred to as Individual Jihad. We rather view you as a group, a brigade, or even an army in itself. A single operation that you execute, we wish we had an army that would carry it out. However, you are that army …”“New video message from al-Qā’idah in the Arabian Peninsula’s Shaykh Qāsim al-Raymī: ‘An Inspire Address #1: A Lone Mujāhid or An Army By Itself’” Jihadology, May 7, 2017, https://jihadology.net/2017/05/07/new-video-message-from-al-qaidah-in-the-arabian-peninsulas-shaykh-qasim-al-raymi-an-inspire-address-1-a-lone-mujahid-or-an-army-by-itself/. “All of you must direct and gather your arrows and swords against [the U.S.]”Dana Ford, “New AQAP chief calls for attacks on U.S.,” CNN, July 10, 2015, http://www.cnn.com/2015/07/09/middleeast/aqap-leader-message/. “I pledge allegiance to you…and to wage jihad in the cause of Allah the Almighty.”Thomas Joscelyn, “New AQAP Leader renews allegiance to the ‘beloved father,’ Ayman al Zawahiri,” Long War Journal, July 9, 2015, http://www.longwarjournal.org/archives/2016/09/fifteen-years-after-the-911-attacks-al-qaeda-fights-on.php. Addressing the Houthis: “You have to know that the mosques of Muslims that you blew up along with their homes and schools will not just pass unnoticed and you will pay the price dearly. The account is long and it has not yet been opened. So be prepared to pay for it with your souls and selves. Do you think that your crimes will pass by without judgment or punishment?”“Yemen’s AQAP Says Houthis Will Pay for Push into Country,” Reuters, November 21, 2014, http://www.reuters.com/article/2014/11/21/us-yemen-qaeda-warning-idUSKCN0J518B20141121. The Houthi rebels are “the coming rifle of America.” Al-Raymi threatens the Houthis with “horrors that will make the hair of young children turn grey.”Oren Adaki, “AQAP military commander rallies Sunnis against alleged US-Houthi alliance,” Long War Journal, November 24, 2014, http://www.longwarjournal.org/archives/2014/11/aqap_military_commander_rallie.php. “[Yemeni ministries] cooperate with the American drones by spying, planting chips, providing information or offering intelligence advice… all these are considered legitimate targets for us. We have a long list of these places, in case they will continue we will continue. We will reach them. Because we defend ourselves… And by the will of the exalted we will reach them before they reach us.”“Al-Malahim Media presents a new video message from al-Qa’ida in the Arabian Peninsula’s Qasim al-Raymi: ‘Comment on the Targeting of the Defense Ministry in Sanaa,’” Jihadology, December 21, 2013, http://jihadology.net/2013/12/21/al-mala%E1%B8%A5im-media-presents-a-new-video-message-from-al-qaidah-in-the-arabian-peninsulas-qasim-al-raymi-comment-on-the-targeting-of-the-defense-ministry-in-%E1%B9%A3anaa/. “We attacked the ministry, the Minister of Defense Command Centre to be precise. This building is from whence the Unmanned Drone Control Chambers are administered [sic]. The ministry has changed from a ministry claiming to protect the country and citizens to a ministry of distributing tracking chips for the American drones…”“Al-Malahim Media presents a new video message from al-Qa’ida in the Arabian Peninsula’s Qasim al-Raymi: ‘Comment on the Targeting of the Defense Ministry in Sanaa,’” Jihadology, December 21, 2013, http://jihadology.net/2013/12/21/al-mala%E1%B8%A5im-media-presents-a-new-video-message-from-al-qaidah-in-the-arabian-peninsulas-qasim-al-raymi-comment-on-the-targeting-of-the-defense-ministry-in-%E1%B9%A3anaa/. “Whatever our sharia commands us we will do. Because we are preachers of sharia and not frauds.”“Al-Malahim Media presents a new video message from al-Qa’ida in the Arabian Peninsula’s Qasim al-Raymi: ‘Comment on the Targeting of the Defense Ministry in Sanaa,’” Jihadology, December 21, 2013, http://jihadology.net/2013/12/21/al-mala%E1%B8%A5im-media-presents-a-new-video-message-from-al-qaidah-in-the-arabian-peninsulas-qasim-al-raymi-comment-on-the-targeting-of-the-defense-ministry-in-%E1%B9%A3anaa/. “Finally, to the oppressed and subdued in America among the brothers of religion and creed. We encourage you to carry on with this way, be steadfast on this deen. Carry out your obligations, defend your religion and follow in the footsteps of those who supported their religion and ummah whilst they are in their enemy's den.”“Al-Qaeda Arabian Peninsula’s (AQAP) Qasim al-Rimi Video Indicator of Upcoming Attack Against Americans,” IntelCenter, June 2, 2013, http://intelcenter.com/reports/AQAP-ThreatWarning-2Jun2013.html. “O American nation, did the war end with the killing of Sheikh Osama bin Laden (may Allah accept him) like you leaders lied unto you? Did the call to fight you end with the killing of Sheikh Anwar al-Awlaki like they exploited your inattention? Did your aggression on Afghanistan, Palestine and other Muslim countries end? Did you annihilate the Jihadi groups that, by the Grace of Allah, have spread everywhere after they have only been in Afghanistan? Today, they are near your homes if not in them.”“Al-Qaeda Arabian Peninsula’s (AQAP) Qasim al-Rimi Video Indicator of Upcoming Attack Against Americans,” IntelCenter, June 2, 2013, http://intelcenter.com/reports/AQAP-ThreatWarning-2Jun2013.html. “Instead, everyday you will be hit by the unexpected and your leaders can repel nothing! Do not deny when evil befalls you, when you taste a bit of destruction that you inflict on others. Hence, blame none but yourselves. Gulp the bitterness of war, death, destruction and insecurity as other oppressed humans do. The two decade war has not laid down its burden, rather it is at its peak. The war between you and us has not ceased...”“Al-Qaeda Arabian Peninsula’s (AQAP) Qasim al-Rimi Video Indicator of Upcoming Attack Against Americans,” IntelCenter, June 2, 2013, http://intelcenter.com/reports/AQAP-ThreatWarning-2Jun2013.html. “Is your support for the Jews in Palestine excusable? Is the killing of our children and women in Kabul, Baghdad, Mogadishu and Sanaa excusable? Is meddling in our affairs and installing whomever tyrant agents and lackeys you want who kill and oppress our nation forgivable. And a lot of others including plundering, looting, countless forms of oppression and aggression, do you dare think that after all this you will be salvaged and feel secure? Nay! Wallah! [I swear! ]”“Al-Qaeda Arabian Peninsula’s (AQAP) Qasim al-Rimi Video Indicator of Upcoming Attack Against Americans,” IntelCenter, June 2, 2013, http://intelcenter.com/reports/AQAP-ThreatWarning-2Jun2013.html. “Your leaders are assaultive, oppressive and tyrannical, and you stand behind them cheering, supporting and voting for them. Do you think anyone will excuse you while your leaders induce you to err, kill Muslims and support whoever kills them just for being a suspect? Then you come about claiming you have the right to defend yourselves! How about the aggression which is clear to your fools, and is not denied by your young, will you be excused of?” “Al-Qaeda Arabian Peninsula’s (AQAP) Qasim al-Rimi Video Indicator of Upcoming Attack Against Americans,” IntelCenter, June 2, 2013, http://intelcenter.com/reports/AQAP-ThreatWarning-2Jun2013.html. “O American nation, indeed, your security is not achieved by despoiling other nations' security or by attacking and oppressing them. Your security is achieved by stopping the foolish, who rule you, from oppression and aggression. Know that oppression and aggression rebound on the throats of the perpetrators.”“Al-Qaeda Arabian Peninsula’s (AQAP) Qasim al-Rimi Video Indicator of Upcoming Attack Against Americans,” IntelCenter, June 2, 2013, http://intelcenter.com/reports/AQAP-ThreatWarning-2Jun2013.html. “The two-decade war has not laid down its burden, rather it is at its peak. The war between you [America] and us has not ceased, we suffer hardships and you suffer too, we are killed as you are killed but we have a hope from Allah (for the reward, i.e. Paradise) that for which you hope not…”Qasim Al-Raymi, “Message to the American Nation,” Inspire, 11 (2013): 8-9.